Choose from the full line of Durastill steam water distillers including the Durastill 30H Water Distiller Head, Durastill 30J Water Distiller Head, Durastill 46C Water Distiller Head, Durastill 30J4 Water Distiller System, Durastill 3040 Water Distiller System , Durastill 4640 Water Distiller System, Durastill 4696 Water Distiller System, Durastill 4280 Water Distiller System. 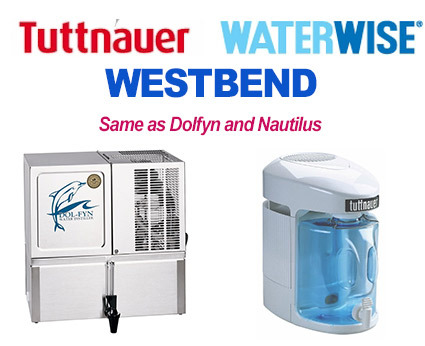 Choose from the full line of West Bend – Dol-fyn Dolphin water distillers including the West Bend Nautilus Counter top Water Distiller, The West Bend Dolfyn AR-18 water distiller, the West bend Dolfyn ARS 2000 Water Distiller, The West Bend Dolfyn ARS 3000 water distiller, and the entire line of West Bend Dol-fyn steam water distiller accessories. 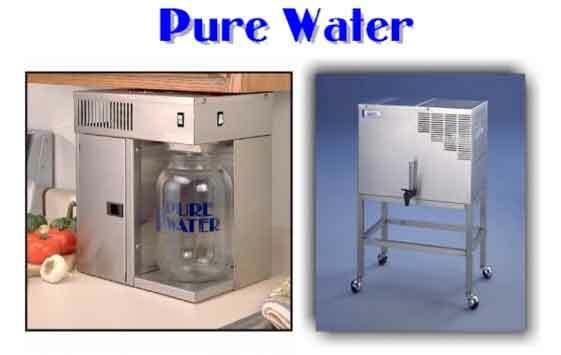 Pure Water Distillers are one of the most recognized name in home and commercial water distillers made in the U.S.A. Choose from the full line of Pure Water steam water distillers including the Pure Water Mini Classic CT water distiller, The Pure Water Midi Classic water distiller, The Pure Water Mega Classic water distiller. 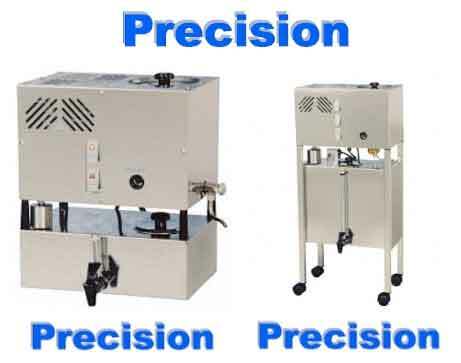 Choose from the full line of Precision steam water distillers including the Precision PWS 8-M Water Distiller Head, Precision PWS 5-3 Water Distiller, Precision PWS 8-5 Water Distiller, Precision PWS 8-8 Water Distiller, Precision PWS 12-12 Water Distiller, Precision PWS 12-20 Water Distiller, Precision PWS 45-75 Water Distiller, and the entire line of Precision steam water distiller accessories. 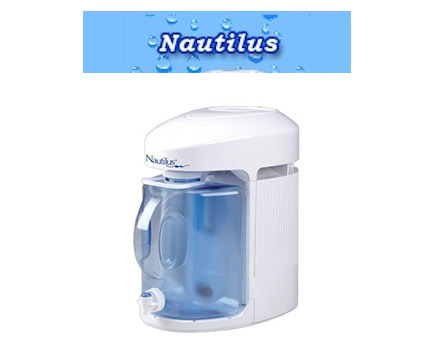 Choose from a variety of Nautilus Water Distiller Bundles. The Nautilus Counter top water distiller is easy to use. Just plug in and you are ready to go. The SteamPure Water Distiller from Pure Water Distiller Systems is priced to give you a stainless steel pure steam distiller with one of the smallest footprints found in a counter top steam pure distiller. It’s one of the top compact portable home, commercial or dental stainless steel counter top water distillers made in the U.S.A. of its kind. 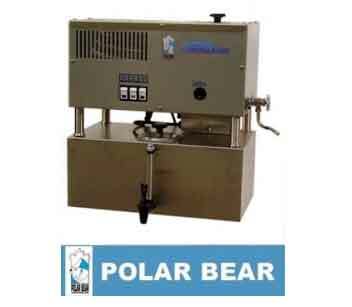 Choose from the full line of Polar Bear water distillers including the Polar Bear 26D-8 Water Distiller, Polar Bear 42D-10 Water Distiller, Polar Bear 42D-25 water distiller, and the entire line of Polar Bear water distiller accessories. While this line of distillers is no longer in production we can often have access to new models. We also carry the full line of Polar Bear parts. at a often at a much lower price. The SteamPure is perfect for limited counter spaces, limited budgets, emergencies, long life and sustainability. It offers high quality with a high value. 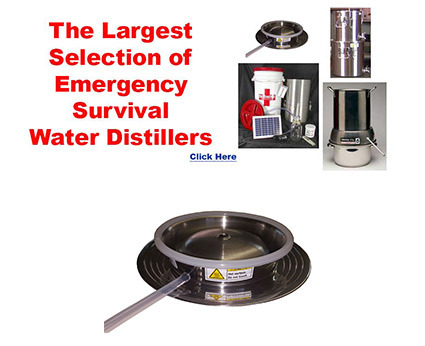 We offer the widest selection of off-grid and on-grid emergency survival water distillers. Choose from the compact model that fits in a backpack all the way up to the high volume solar-powered water distiller for emergency situations where electricity is not available. Steam water distillers produce pure drinking water using a steam distillation process. 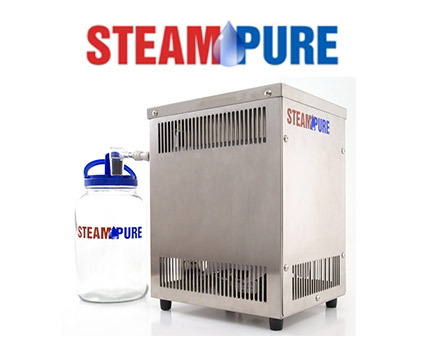 Our full selection of pure steam water distillers from the top U.S. manufacturers are built with solid stainless steel construction and provide steam distilled water for optimal health. Browse our selection of steam distillers and find the steam water distiller that is right for you and your health goals. How to filter water is one of the most frequent questions we get about steam water distillers. The question is flawed to begin with because to filter water is not the function of steam water distillers, but just one of the basic ways of water treatment that does not take out all of the contaminants. Drinking water, or the purification of water so that it is drinkable, can be accomplished through water purification or filtration of water, but to get pure water – or 99.9% pure water is to use steam water distillers or the steam distillation process. 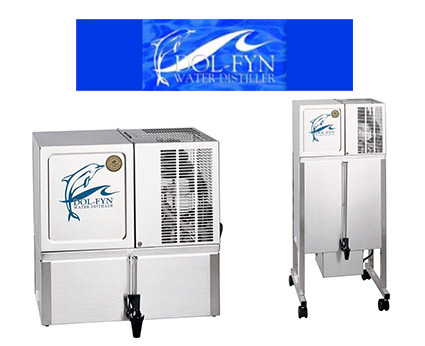 WaterDistillers.com offers the following brands: Durastill Steam Water Distillers, Pure Water Steam Water Distillers, Precision Steam Water Distillers, Dol-fyn Dolphin steam water distillers, West Bend Steam Water Distillers, and DistillerPure Steam Water Distillers. These companies have been in the steam water distilling business for many years and most are made in the U.S.A. or right across the border in Canada. 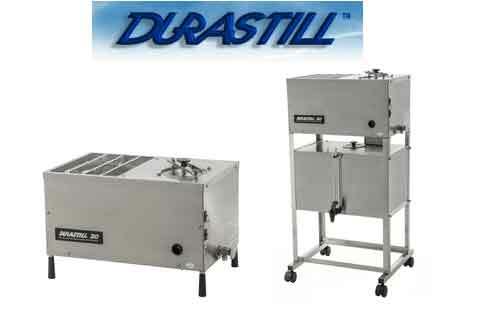 We offer the highest quality steam water distillers made from stainless steel to offer a long life. It is important to buy a water distiller from a reputable company with a sound line of brand names. Buying a well known water distiller will last 25 years or more with only minor upkeep and maintenance. Small water distiller companies often carry lesser known brand water distillers and often go out of business. Buying water distillers from these companies creates the possible problem of not finding spare parts in the life of your water distiller. There are seven big names in water distillation products worldwide: Polar Bear water distillers, Durastill water distillers, West Bend water distillers, Pure Water water distillers, Precision water distillers, Dol-fyn, Dolphin water distillers and SteamPure water distillers. Each has over 25 years experience in the design and manufacture of water distillers and a successful financial record to back it up. Production rate is the specification that measures the rate at which water is produced through the water distiller. Water distillers range from 3 gal/day (1gal/8hrs) to 12 gal/day (1gal/2hrs) for residential, dental, industrial, medical,and recreational vehicle RV units, and more for commercial application water distillers. Water distillers are either Manual water distillers, Semi-Automatic water distillers or Automatic water distillers. Manual water distillers produce one gallon of water at a time due to limitations of the distiller’s boiling chamber size. While automatic water distillers are connected directly to the water line and can continually produce distilled water. These water distiller companies; Durastill water distillers, Precision Water distillers, Pure Water water distillers, West Bend water distillers, Dol-fyn dolphin water distillers, and DistillerPure water distillers have been providing these type of water distillers for over 25 years. Distillation, the process of removing contaminants from water, removes 98%-99.9% of distilled water contaminants producing distilled water. The distance between the boiling chamber and condensing coil along with the construction material is determinate of a water distiller’s ability to remove impurities. purer distilled water from your water distiller.Water Distiller Construction – The best construction material is surgical quality stainless steel.Water Distiller Storage Containment – The best materials for water distiller storage is stainless steal or glass. While glass maintains a high level of water purity, it is not as durable as stainless steal, which is why it is not the most reliable storage container used by the water distiller. Please call or contact us for more information. This page and its contents copyright WaterDistillers.com WaterDistillers.com offers a complete line of water distillers, water filters and water filtration.systems including non-electric water distillers, solar water distillers, gravity water filters, ceramic filters, ceramic water filters, agua pura, agua purificada and agua salud designed for home, commercial, industrial, dental and medical use.